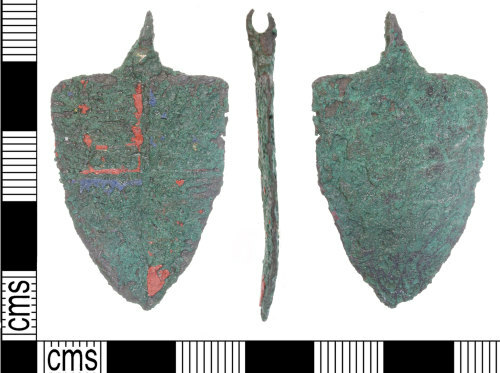 A complete copper alloy Harness Pendant of the Medieval Period, dating from AD 1200 - AD 1400. The pendant is a "heater" shield shaped type (flat top with sides sloping steeply to a point). On the flat edge is an integral suspension loop set at a right angle to the pendant; the loop has been broken away by an olg break. The front face of the pendant shows moulded heraldic decoration, divided in to four quarters; two of the quarters contain of three passant lions left with paws raised on a red enamel background. The other two quarters are very worn and unreadable but once contained blue enamel. The reverse is plain and undecorated. The pendant measures 43.2mm long, 26.2mm wide, 2.9mm thick and weighs 9.15 grams.